Quarrying in the old days was often carried out at astonishing places, leaving very special formations – and legends – behind. The “Devil’s Church” or Tüfels Chilen in the Canton of Zurich is such a remarkable, combined work of nature and man. But why a church – and why does the devil appear? At first sight the place, in a small valley not far from Winterthur, seems like a pure natural wonder. 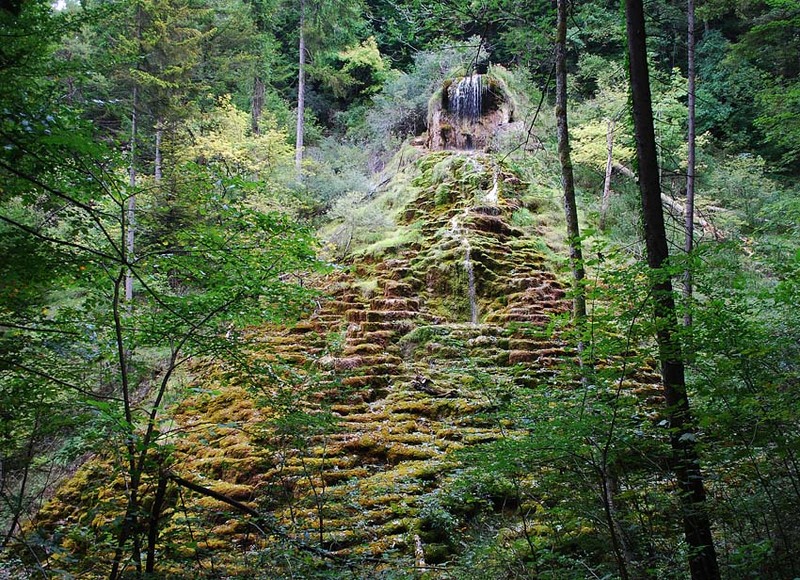 Water trickles down dozens of tiny terraces in the calcareous tufa, developed over some thousands of years to an almost perfect, 60 m high cone in the densely forested hillside. The tufa has formed from water penetrating moraine gravel, coming to the surface as small springs on reaching an impermeable layer of marl in the local Molasse sandstone. Close-up of the porous tuff from "Tüfels Chilen"
This is a common phenomenon: Water picks up calcium from stone, gravel or sand, which crystallises in a complex process, in which moss and other organic material also play a role, as calcium carbonate when water comes in contact with the air. Crystallisation must start somewhere, typically on moss, leaves or small branches. 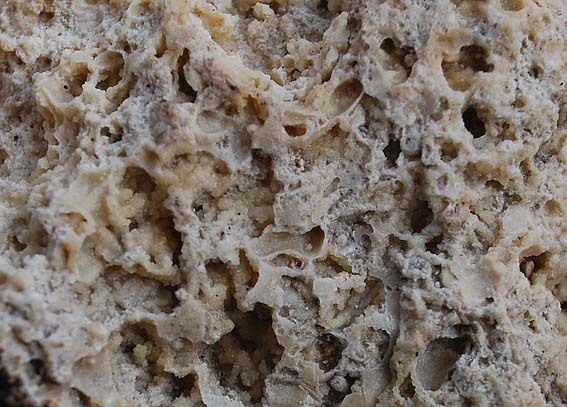 Upon decay of these organic substances, the distinctive, porous fabric of calcareous tufa remains. Quarrying since the Roman period? In this case the cone is made by nature, but not the terraces. They are the typical step-like remains of the last periods of stone extraction. It was allegedly undertaken using saws and ceased in the late 19th century. By written sources quarrying can be traced back to the 17th century, but the history is probably very much older. 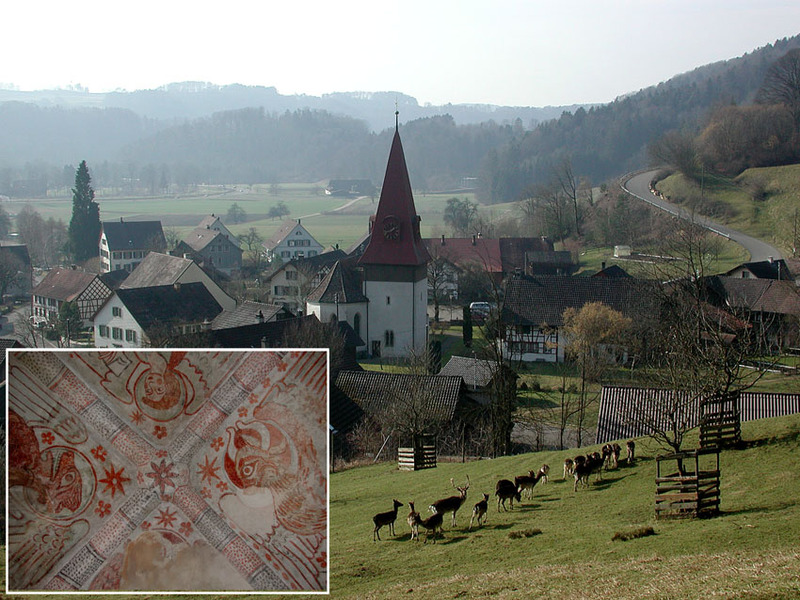 Calcareous tufa was used already in the Roman period and later applied for bases, mouldings and high up in the towers of medieval churches in the region, for example in the nearby church of Zell. It was a valued stone because it is light and insensitive to weathering. This is due to the high porosity that leaves enough space for water to freeze (or soluble salt to crystallise) without exerting pressure on the stone’s fabric. And with all the big pores water is not easily sucked up, implying that the stone performs well in the base of a building. Why is such a wonderful place with such a great stone associated with both church and devil? The church may refer to the steps, almost leading up to an altar-like structure on top. But also a former natural cave may be of importance – a cave that supposedly was destroyed by the stone extraction. The name “Devil’s Church” is first mentioned in early 18th century documents, but Barbara Hutzl-Ronge, an explorer of magic places, seeks the roots of the name much further back. She uses legends and myths, suggesting that it would have been a pre-Christian cult place due to the special rock formation and water source. By the introduction of Christianity, pagan cult places were often demonised by missionaries, while people still carrying out rituals here became excluded from society. Simultaneously, in folk-belief, the giants and gods that had created such special rock formations transformed to angry devils. Whatever the origin of the name, Devil’s Church is not a unique quarry in being identified as special, perhaps sacred. However, most other quarries interpreted in such a manner are prehistoric, connected to procurement of stone axes and flint tools in the Mesolithic and Neolithic. 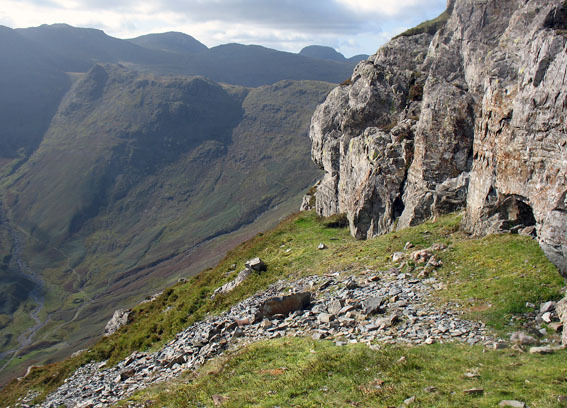 Richard Bradley notes that quarrying of stone axes in the Cumbrian highlands (UK) did not take place at the best-quality outcrops, but at very special, elevated places with grand vistas, high up in the mountains, far away from settlements. Procurement of stone in the Neolithic may have been connected with ritual journeys, ritualised quarrying and the use of quarries for ritual purposes (e.g. burials). In aboriginal Australia and ancient Egypt there are similar indications that quarrying was connected with rites, e.g. the creation of rock art. 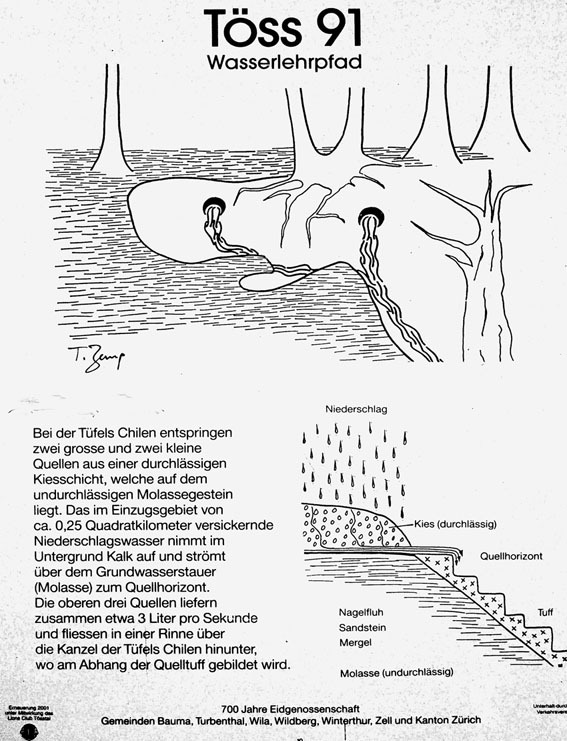 Is it possible that the magic surrounding “Tüfels Chilen” was not only connected with its special location, but also with the seemingly mundane activity of stone extraction itself? Evidence is lacking, but rites connected to stone procurement may not have ceased in the Stone Age. In this respect it is interesting to look to the the neighbouring areas of mining and tunnelling, in which rituals are still performed. For example, by the recent breaktrough in the new St. Gotthard tunnel in Switzerland, the world’s longest hole through rock, St. Barbara, the patron saint of particularly miners, was venerated by placing her statue in a niche in the tunnel – together with photos of the tunnelers that died during work. For many people the magic of Devil’s Church is still very much alive. It is not only visited by numerous hikers, but also by various more or less esoteric groups seeking the power with which they consider the place associated. It has become an important modern “Kraftort” (magic place), like another old quarry in Switzerland, the “Emma Kunz Cave” in Würenlos (canton Aargau), where building stone and millstone were procured from the Roman period onward. Devil’s Church is protected as a landscape of regional significance since 1996. 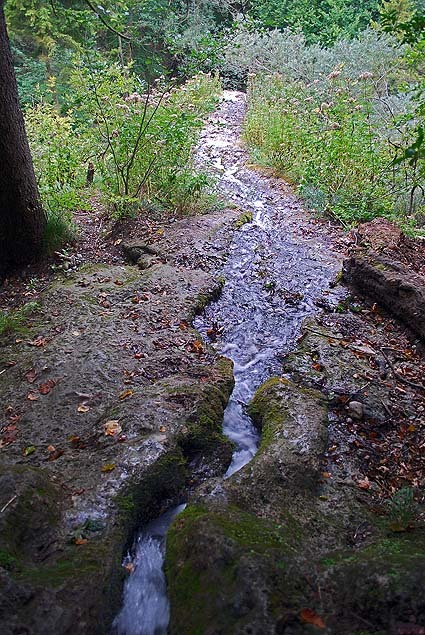 It is listed in the Swiss national inventory of geotopes and there is information about the site, especially related to the “geology of water”, on information boards along the hiking trail that passes by. 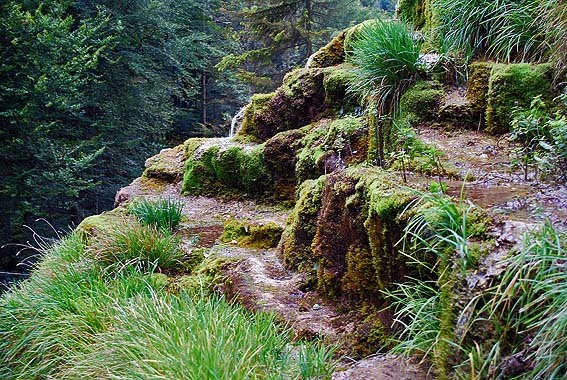 Moss, being a very important feature of the terraces of the quarry, is also a part of the site’s significance. This entry was posted in Archaeology, Old quarries, Switzerland and tagged quarry, Switzerland, Tüfel's Chilen, tufa. Bookmark the permalink.